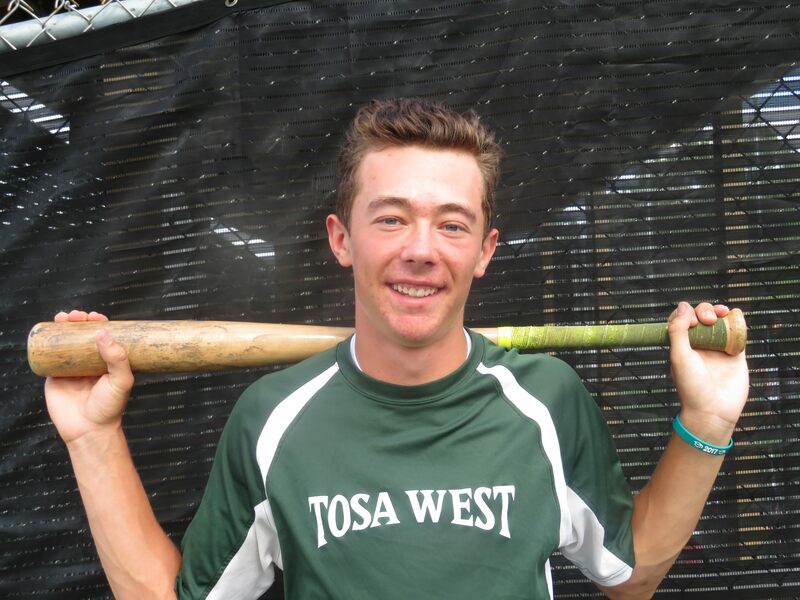 First-year head Coach Dave Belknapp needed a backup catcher at Wauwatosa West this season, but had no one to turn to - until senior Tyler Schackmuth stepped forth in the off-season. Belknapp can't stress enough how much Schackmuth's move behind the plate has helped the Trojans. "I can't emphasize enough his transition to catcher - the very first conversation was at an open gym," he recalled. "We were going over the team and where we saw guys catching. Besides Logan (Scharf), we have a couple of young guys but I didn't see as freshman doing the job and instantly he said 'I'd be happy to go back there.' And from that day on - and that's another tribute to him - even at this point in the season - he's still looking to improve. "He's a very athletic kid," Belknapp said. "He's played volleyball and he was versatile. He played a lot of positions in Jr. Trojans. This season for us he was a lifesaver, going behind the plate. It was very unselfish of him. I don't think he had caught since 7th or 8th grade. And he's done a fantastic job and helped out at a position where we had very little depth." When starting catcher Logan Scharf goes out to the mound, Schackmuth moves from his regular left field spot to behind the plate. Tyler credits Trojans former multi-sport star Zack Veit with helping him make the transition. "Coach Veit caught when he was a senior, and taught me the ropes pretty well. Catching is fun. You can control the game, control the pace of the game, which pitch is called. Plus I can throw people out." Schackmuth recently talked about his progress behind the plate. "Giving my all is my strong point," he said. "I'm not exactly technically sound, not having been playing (catcher) long. Selecting a pitch for the appropriate count; I think I've come along way. As the season has gone on I'm more comfortable with it. I call games, but the pitcher has the right to shake it off." Photo by Tom "Sky" Skibosh --- Tyler Schackmuth was named second team Woodland West catcher this week despite not having played the position since 7th grade. 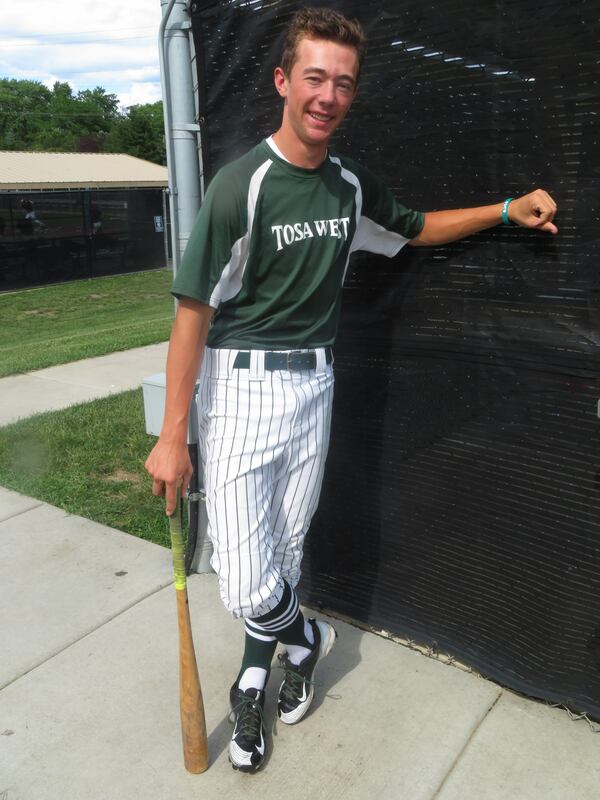 Looking back, Schackmuth started off his baseball career with tee-ball, then advanced to the Tosa Baseball League and the Northwest Little League, before joining a travel team with the Jr. Trojans. "My dad (Adam) was a pretty good player in high school. He pushed me, took me to batting cage," Tyler recalled, explaining why he stayed with baseball. "I enjoyed the nuances that the average person wouldn't see - the first and third situation. Guy on third less than one out, hitting him over, hitting him in. The little things." Belknapp remembers as far back as seeing Tyler in 6th grade, along with 3-4 of his current teammates. "They're still playing here, a good group," Belknapp said. "But Tyler is the ultimate team player. He'll play where you want him to play. He'll bat wherever you want to use him. He's been leading off. "We put him in the lead-off spot. He's very consistent in putting balls in play, very consistent in hitting line drives. He is a very good lead-off hitter because he understands his role - he puts the ball in play and gets things going. He's got good speed and he's done a great job with that." Belknapp couldn't say enough positive things about how Schackmuth goes about his job at the plate. "He takes what's there, he doesn't force it," he said. "He makes good solid contact. He can be aggressive. When he sees his pitch, he jumps on it. "But the other attribute that makes him a good lead-off hitter is he won't chase out of the strike zone. He knows what he can do. He's not a power hitter, but a guy who is going to drive it to the gap; put a good swing on the ball, hit line drives, hard ground balls, hit pitches in the strike zone." Tyler knows his strengths as a hitter. "I try and hit line drives up the middle, to the right side of the field actually," he said. It's what I excel at. Situational hitting too. It's a chance to score runs for your team." Schackmuth was on the JV as a freshman, then as a sophomore he played half a year on varsity, getting in some games as a pitcher. Because of some injuries he played left field in a playoff game, but he also contributed as a pinch-runner. Photo by Tom "Sky" Skibosh --- Tyler batted .333, with a .405 OBP and finished second on the team in runs (14) from his lead-off spot. He also won a game in relief. With all the emphasis on when Tyler stepped up behind the plate, his main position has been left field. "I played left since all through my junior leagues. I'm pretty comfortable out there," he said. "I focus on keeping my head in the game, knowing the situation. I pride myself on being a student of the game, knowing where the runners are, if the ball is hit to me what am I doing with it. "I would say that's really my strength. I don't have the strongest arm and I'm not the fastest, but I know what you have to do with the ball when you get it. Take advantage of it. It's fun. Especially throwing people out." Belknapp talked positively about Tyler's outfield play. "He gets a jump on the ball, he's a good athlete with very good speed," he said. "He can run balls down. He has a nice arm, about average. He's very accurate. In left field you are not called on to make some of those moves like in centerfield. He just puts it on target." Belknapp was asked what stood out the most about Tyler and he didn't hesitate. "His smarts - his baseball instincts are something that grows with you every year you play," he said. "So he has the experience there. It's a whole other thing that he will have the presence of mind to apply it in different game situations. "What he thinks about what he goes through in the outfield; when he thinks about his responsibilities as a catcher. He is very cerebral. He knows the game and he understands what situations call for. Catcher has to be the hardest position to play. Here in his senior season he's done a great job with it." Belknapp pointed about Schackmuth's leadership skills. "He is the proto-typical leader by example," he said. "He goes out there and does his job. He's very unselfish, positive all the time. He will pick other guys up. He is never concerned with himself. "He's the guy - watch him play, watch how he prepares. You will do well if you do what Tyler does from game to game. He is just very well prepared." Not surprisingly, Tyler is quick to credit someone else when asked about the team's leadership - Coach Veit. "Our coach Veit was a great leader here and really inspirational in what a team should look like," he said. "He had senior leadership and everyone is on the same page and stuff. We have about 50 per cent seniors on the team and we're good as being one as a team. "On our baseball team it's a lot of fun coming out here every single day, playing your hearts out and winning close games. It's a lot of fun." And Schackmuth is one of the main reasons for it. FAVORITE MUSIC: Rap & Country Music. FAVORITE MOVIE: 'Sand Lot.' Comedies. FAVORITE PLACE YOU VISITED: Family Cottage in Townsend County. FAVORITE SPORTS RIVALRY: Wauwatosa East. MOST MEMORABLE MOMENT: First game this season the Trojans defeated Cudahy, 2-1, with a walk-off hit. WHAT DO YOU WANT TO DO IN THE FUTURE: Attend at the University of Wisconsin - Madison and study Actuarial Science.